English Channel swimming has become relatively commonplace with, by the end of 2014, 1912 successful solo swims, including a number of multiple crossings, had been made. In the early part of the 20th century though, the sport was in its infancy. One of the leading figures in the nascent sport was Hilda Sharp from Leahurst Road in Hither Green (1). While Matthew Webb had been the first successful swimmer to cross the channel in 1875, la Manche wasn’t conquered again until 1911 and it wasn’t until 1923 that there was a third successful attempt. Records tumbled in 1926 when the Frenchman George Michel completed the crossing in 11 hours 5 minutes and the first woman, the American Gertrude Ederle, made the crossing from France to England in 14 hours 39 minutes on 6 August. British pride seemed to want the fastest woman to be British and the Dover municipal authorities offered a gold cup with a £5000 prize, oddly donated by an American film company, to any British woman beating Erdele’s time. In 1927 two British women successfully swam the channel – Ivy Gill and Mercedes Gleitz – but both were over half an hour outside the time set by the American. Sharp was to make her successful attempt on 24 August 1928, she was coached by the nearly man of Channel, the Glaswegian, Jabez Wolffe – who made 22 unsuccessful attempts to swim the Channel on one occasion only failing by a few yards. He tried various odd techniques to try to help him including on one occasion being accompanied by a Pipe-Major playing the bagpipes it an attempt to keep his stroke rhythm in time at 29-32 a minute. He had much greater success as a coach though. Swimming in cold waters, long walking trips, eating juicy, sustaining steaks and drinking occasional glasses of black beer. The inclusion of the last ingredient in the training diet is to make the girls fat, providing more buoyancy in the water and additional resistance to cold and exposure. 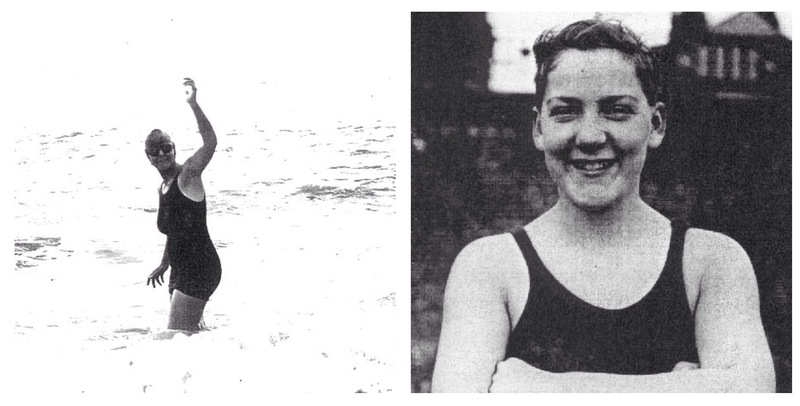 Hilda Sharp left France, close to Cap Gris Nez, in the early hours of 24 August using the ‘Trudgen stroke’ – an early incarnation of the front crawl and used the tides to help her to cross the Channel. Press reports suggested she struggled towards the end as tides turned and she ended up using breast stroke over the last mile or two. A large flotilla followed her into shore, less than half an hour outside Erdele’s time (3). Sharp had become only the 15th swimmer to cross the Channel, and the then 5th fastest, setting a clear British women’s record which lasted until a swim by Fernley Wheatcroft in 1938. Channel swimming was significant news in the 1920s – British Pathé News covered the swim. British Pathé News also covered her ‘homecoming’ – being presented to large crowds outside the old town hall in Catford (this footage has yet to be included in YouTube, so is not possible to ‘embed’ in Word Press – but can be found here). 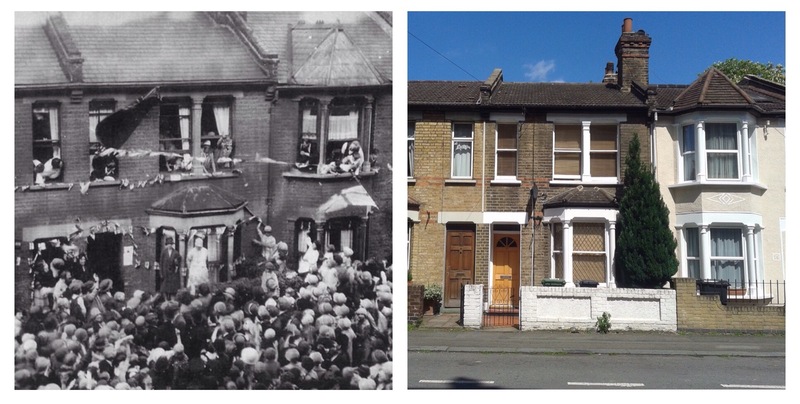 Crowds also gathered outside 73 Leahurst Road too, as the then and now photos below shows (4). She planned to make the crossing again in 1929 working with a training partner, Connie Gilhead, in Brighton. However, 1929 seemed to be a summer of unfavourable wind and choppy seas – and neither of them repeated Sharp’s feat on the previous summer. Indeed no-one made a successful swim that summer. This entry was posted in Lewisham History, Sporting & Aviation Pioneers and tagged Channel swimming, Hilda Sharp, Laddie Sharp on June 4, 2015 by Paul B.
Thats my Great Grand Mum! As far as I can tell Hilda did emigrate to Canada (she’d spoken in interviews before her swim about buying a farm in Australia if she broke Trudie Ederle’s record and won the £5000 prize). She married William Lyons, a widowed mechanic originally from Hull, in Toronto in 1936 and made a few visits to England over the next 20 years or so. In 1956 she arrives giving her occupation as ‘swimming instructress’ and four years later she’s back again but there the trail goes cold. If Jennifer can supply any more details I’d be dead interested (am researching a book).